The Kosciuszko Polish Home Association was the result of a desire to unite a number of the social and religious organizations of St. Hedwig’s Church. On June 20, 1920, a meeting was held at Papierski’s Novelty Shop in which St. Joseph Society #132 P.C.U., Group #608 P.N.A., Wladyslaw Jagiello Group #1193 P.N.A., St. Casimir Society #234, and three other organizations all agreed to support a new Polish home for Dunkirk. Delegates from each of the groups were selected. Michael Czysz was elected president, Casimir Michalak as Vice President, Frank X. Lewandowski Secretary, Frank Bartela as treasurer. With a strong membership base, fundraising for a building began in earnest. As money began to be collected the “Dom Polski of the 4th Ward” was incorporated on March 31, 1922 as the Kosciuszko Polish Home Association. 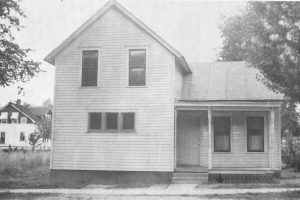 Within two years the club had enough cash on hand to afford a mortgage and on May 26, 1924, a building at the corner of Doughtry and Nevis was purchased. Like many organizations the club struggled through the Depression but in 1937 the mortgage was paid off. Despite owning the home free and clear, the Kosciuszkos had become an organization run by an older generation. A Young Men’s Club was formed and with the election of George Woloszyn a new era began. The Young Men’s Club began to heavily recruit members, whose new ideas and outlook reinvigorated the organization. As World War II ended and America prospered, a committee was formed to explore the possibility of building a new home for the 4th Ward. A groundbreaking ceremony was held on April 15, 1953 for the planned 93 by 75-foot modern brick building. The new home would have space for two ballrooms, a lounge and a reading room. 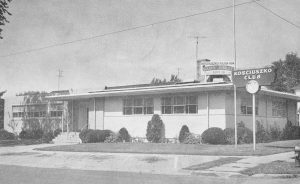 On May 29, 1954 the completed building was formally dedicated with a banquet and presentations. Dunkirk City Attorney Thomas P. Nowicki served as toastmaster while Buffalo City Parks Commissioner John A. Ulinski was the keynote speaker. The guest list of 300 was a veritable who’s who of Polonia and Dunkirk’s political class, including Mayor Bernard Dougherty and much of the Common Council. The new building would see a number of influential politicians and Poles cross its threshold over the years. One of the first formal functions held at the home was a visit by Robert F. Wagner, the 102nd Mayor of New York City. A few years after the mayor’s visit, Polish jurist and Supreme Court Justice, Matthew J. Jasen was honored by both Dunkirk Democrats and the home. In the second half of the twentieth century the Kosciuszkos would continue to show their deep devotion to both Dunkirk and her Polonia. In 1963, after the American Locomotive Company Products plant closed, the club contributed over $13,000 towards the purchase and rehabilitation of the property. The parcel between Franklin Ave. and Roberts Rd. would become the Progress Park Industrial Complex and eventually home to Cott Beverages. 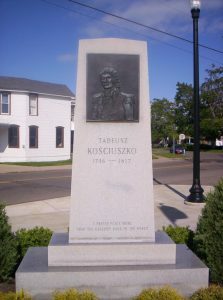 To improve Polonia, the club began a project in 1971 to erect a monument to Kosciuszko at the intersection of Lake Shore, Roberts, and East Front streets. Chaired by Clem Lutz the club raised the necessary funds and August 30, 1971 the memorial was dedicated. The Kosciuszko Polish Home Association continues to remain true its Polish roots in the twenty-first century and is a popular destination for its Dyngus Day party. "Alco Drive Hits Total Of $248,500." Jamestown Post-Journal [Jamestown, NY] 1 Feb. 1963: 9. Print. "Dedication Is Planned." Buffalo Courier-Express [Buffalo, NY] 26 May 1954: 11. Print. "Democrats Plan Testimonial To Jasen at Dunkirk Dec. 14." The Fredonia Censor [Fredonia, NY] 4 Dec. 1958: 1. Print. "Democrats to Honor Jasen at Dunkirk." Buffalo Courier-Express [Buffalo, NY] 1 Dec. 1958: 8. Print. Golden Jubilee Committee. Golden Jubilee 1920-1970 Kosciuszko Polish Home Association. Dunkirk, NY: n.p., 1970. Print. Herrington, Mary Ann. "Five Gems Make Dunkirk Polonia Shine." The Am-Pol Eagle. The Am-Pol Eagle, 15 July 2009. Web. 15 Nov. 2016. "Justice Jasen to Be Feted at Dunkirk." The Fredonia Censor [Fredonia, NY] 20 Nov. 1958: 1. Print. "Kosciuszko Club At Dunkirk to Be Dedicated May 29." The Fredonia Censor [Fredonia, NY] 27 May 1954: 4. Print. "New York Mayor To Be 'Victory' Dinner Speaker." The Fredonia Censor [Fredonia, NY] 18 Mar. 1954: 1. Print. Witul, Gregory L. "Kosciuszko Polish Home Association Grew in Dunkirk." Am-Pol Eagle [Cheektowaga, New York] 11 Sept. 2014: 11. Print. "Year Reviewed With Highlights Of 1958 Events." The Fredonia Censor [Fredonia, NY] 30 Dec. 1958: 7-8. Print.